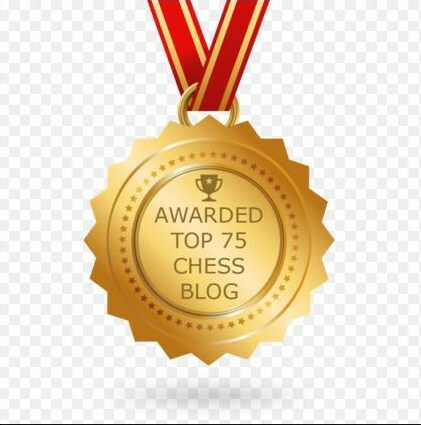 Blogger Robert Pearson [pictured] has included one of my posts in his Best of Chess Blogging carnival. 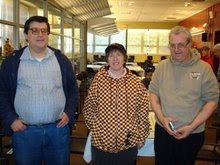 On Wednesday night, I finished the March game/90 Swiss tournament at Chess Mates with a score of 2-0-2. 52.Rg7 Re7 53.Rg2 Re3+ 54.Kb4 Re4+ 55.Kb3 Rd4 56.Rh2 Kc5 57.Rc2+ Kxb5 58.Rxc7 Rd3+ 59.Kc2 Rh3 60.Rg7 Ka5 61.Kb2 b5 62.Rg2 Ka4 63.Rg4+ b4 64.Rg2, draw. Katie Dellamaggiore, director of Brooklyn Castle, is interviewed by Stefany Tomas. 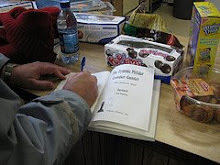 On Sunday, the following game was drawn at the Marshall Chess Club. 35.Bc2+ Ke5 36.Bxh7 Kxd5 37.Be4+ Kc4 38.Bxb7 Kb3 39.h4 gxh4 40.Kxf4 Kxa4 41.Bc6 Kb3 42.Ke4 Kxc3 43.Kd5 Bc7 44.b6 Bxb6 45.Kxd6 Kb4 46.Ke5 a4 47.Kf4 a3 48.Bd5 Kc3 49.g4 Bd4 50.g5, draw. The Marshall Chess Club presents international master Justin Sarkar. International master Justin Sarkar is a professional chess player and teacher. His many tournament victories include the 2008 New York state championship and the 2012 Golden State Open. IM Sarkar’s recent success has propelled his USCF rating to an all-time high of 2544, a gain of over 100 points since the beginning of this year. In his lecture at the Marshall Chess Club, Justin will talk about his recent improvement and his quest for the grandmaster title. He will present and analyze some of his most instructive games. 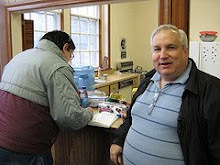 On Saturday, the game/45 Swiss tournament at Chess Mates was won by Andy Chen [pictured left, with owner Art Macaspac]. 34.Ra2 Rb8 35.Rd3 Red8 36.Rad2 Ng6 37.f4 Qb4 38.Qc2 a5 39.e4 Ne7 40.e5 Nc6 41.exd6 Nd4 42.Rxd4 cxd4 43.Rxd4 Rxd6, draw. Thursday afternoon marked the end of the winter session in the after school enrichment program, conducted by Enrich and Grow Academy and coached by me, at Wyoming School in Millburn. In the chess tournament which lasted three weeks, Noah Shin swept the field and finished a clear first. Liam Pilarski took second honors. Justin Matsumoto was awarded the medal for third place, after winning a playoff game against Catherine Antonelli. While watching CNBC yesterday, I saw this commercial. The white king and queen are on the wrong squares! 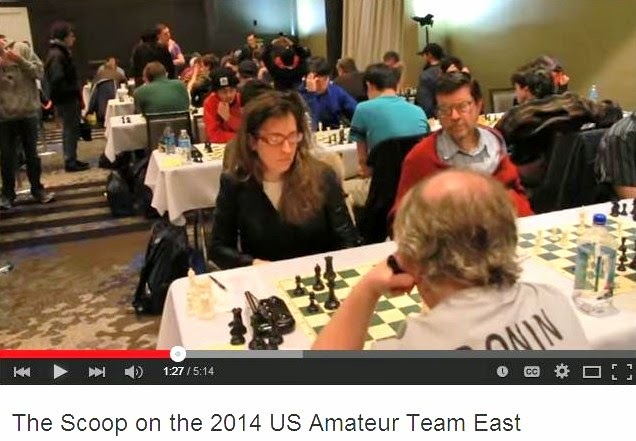 Candidate master Lev Zilbermintz [pictured] has played the Newark Gambit 4...b5 more than three dozen times. In these two games, White tries 5.Bb3. 11.Be3+ c5 12.Qf4 Ne7 13.O-O Ng6 14.Qg3 Qh4, White resigns. 39.Rb1 Rc1+ 40.Rxc1 bxc1=Q+ 41.Kh2 Qc7+ 42.g3 Kxa5 43.Re2 Qd6 44.Ra2+ Kb6 45.Re2 Kc7 46.Kg2 Kd7 47.Rd2 Ke6 48.Re2+ Kf6 49.Rd2 Kg7 50.Re2 Qf6 51.Kh2 Qf5 52.Kg2 Nf6 53.Re7+ Kh6 54.Re2 Ne4, and Black wins. It was a good week for one of my chess students, seven-year-old Vrithik Umapathy [pictured], as he gained more than 100 rating points! Vrithik went 4-0-0 on Saturday at Princeton Charter School in a scholastic tournament. Then he won his quad in Westfield on Sunday with a score of 2-0-1. 10.dxe5 Nxe5 11.Qe2 Nxd3 12.cxd3 Re8 13.Rac1 c6 14.b4 d5 15.f3 d4 16.Bg5 dxc3 17.e5 h6 18.Bf4 Qd4+ 19.Be3 Qxe5 20.Rfe1 Nd5 21.Bc5 Qxe2 22.Rxe2 Rxe2, White resigns. This past Monday, the winter session ended at Shongum Elementary School for the after school chess program, conducted by Enrich and Grow Academy and taught by me. The spring session begins next Monday. 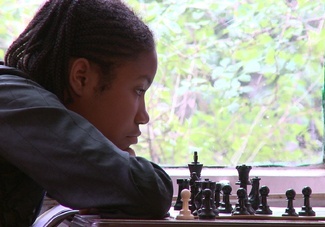 A tournament, involving 22 students, was held during the last three weeks of the winter session. Medals were given for first, second, and third places. With three points apiece, Jesse Lissaur and David Popkin tied for first place. Four students tied for third place, with 2 points: Nicolas Alvarado, Christopher Civetta, Varsha Thampi, and Benjamin Weiss. On tie-breaks, third place was awarded to Christopher Civetta. 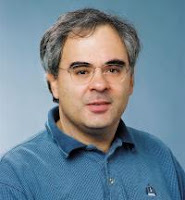 International master Ken Regan [pictured] has built a computer program to detect cheating in chess. On Saturday, I won this game at Chess Mates in the game/45 quads. 36.dxc5 Bxc5 37.Bxb5+ Ke7 38.Nd3 Nxd3 39.Bxd3 a5 40.h3 Ke6 41.Bc3 Bxa3 42.Bxa5 Ke5 43.Kg2 Kf4 44.Bd2+, Black resigns. Pix from Saturday Camp at "Chess Mates"
On Saturday, I was the instructor for the camp at Chess Mates, which has recently added space. These are photos of a new room where two students are watching cartoons on Netflix. Later in the day, I observed grownups watching movies like The Graduate and One Flew Over the Cuckoo's Nest. Rave Reviews for "Brooklyn Castle"
The documentary film Brooklyn Castle is getting rave reviews at hitfix.com, thinkprogress.org, and filmschoolrejects.com. On Wednesday evening, I taught a chess class from 5:30pm to 6:30pm at Wizards of the Mind in Springfield and am scheduled to teach the same class on March 28th. 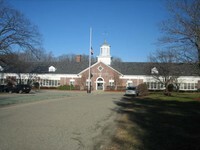 Today at 3:40pm, I begin teaching the spring session at Center Grove School [pictured] in Randolph, for the after school program of Enrich and Grow Academy. 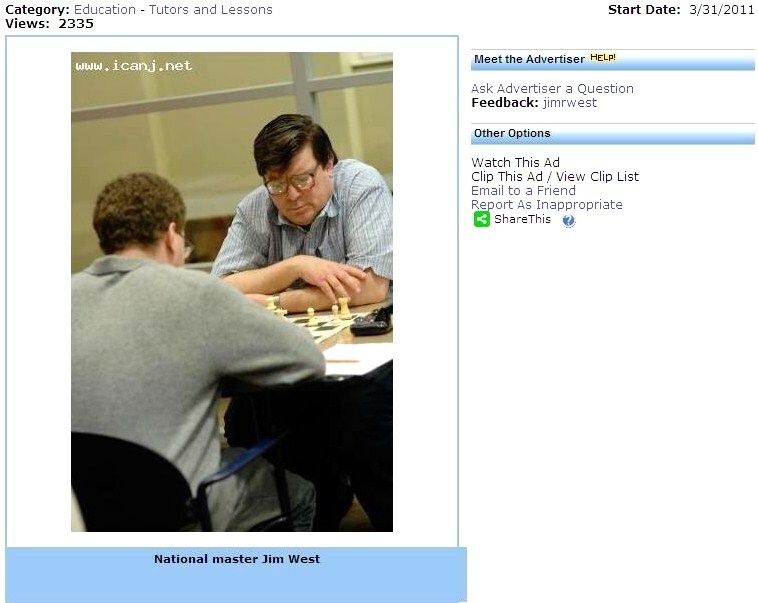 On a sadder note, I will be the substitute instructor for the Sunday camp on March 18th at Chess Mates. Grandmaster Leonid Yudasin will be in Russia, due to the passing away of his father. 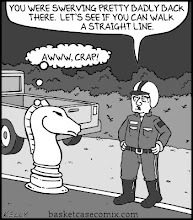 Last night, I drew this game at Chess Mates. 34.Re3 Qf2+ 35.Kh2 Rf3 36.Rxf3 exf3 37.Qc2, draw. THE MARSHALL CHESS CLUB PROUDLY PRESENTS A CONCERT BY QUENTRE. Quentre is a mixed ensemble of New York freelancers who explore musical literature, both new and familiar. Members Jim Ferraiuolo (oboe and flute), Brenda Vincent (violin), Denise Cridge (viola), and Deb Spohnheimer (bass) have delighted audiences in downtown art venues and rococo halls alike. 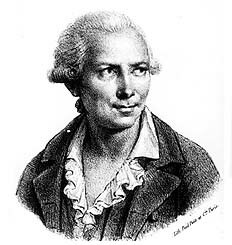 Joining Quentre will be guest artists Kate Light (violin) and Martin Fett (cello). Admission: non-members $15, members $10. 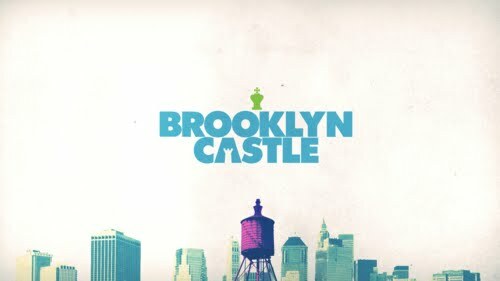 Film Review of "Brooklyn Castle"
The documentary film Brooklyn Castle is reviewed by Adam Frazier. Sony Pictures and producer Scott Rudin have acquired the remake rights. Sunday Camp at "Chess Mates"
On Sunday, I was the instructor for a five-hour camp at Chess Mates, from 10am to 3pm. The students were Anthony Tang, Albert Tang, Angel Munoz-Avila, and Nicky Riggins [pictured, wearing shirts that are beige, blue, black, and red respectively]. 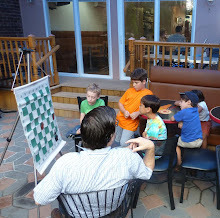 I lectured, gave a simul, and then learned how to play bughouse chess from the kids! 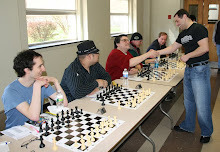 After the camp, a seven-player open tournament (including two masters and one candidate master) and a six-player scholastic tournament took place, with time controls of game/30. My private student Michael Berrios is already familiar with the Philidor Counter Gambit, from many speed games that we have played. Here I tried something else. 31.Qa3 Nb5 32.Qxc5 Kg7 33.Qb4 d4 34.cxd4 Nxd4 35.Bg2 Nbc6 36.Bxc6 Nxc6 37.Qc3+ Qd4 38.Qxd4+ Nxd4 39.Kf2 Kf6 40.Nc4 h5 41.h4 Nc2 42.Kf1 Nb4 43.Ke2 Nd5 44.Kd2 Ke7 45.Ke2 Kf6 46.Kd2 Ke7 47.Ke2 Kf6 48.Kd2, draw. This game was played yesterday at Chess Mates. 39.Kd3 a5 40.Ke4 b6 41.g4 Ke7 42.h4 Bf2 43.h5 Bh4 44.c4 Kd6 45.Kd3 Kc5 46.Bd7 a4 47.Kc2 Bf6 48.Be6, draw. 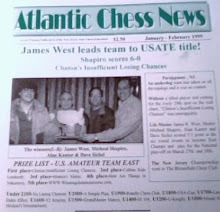 Team Chess Mates of Rahway NJ has resolved its issue with the NJSCF regarding tie-breaks at the USATE 2012. Although the U.S. Amateur Team System under rule 34G2 on page 203 of the USCF rulebrook is used for all other prizes, the Modified Median tie-break is used to determine the top five teams. The NJSCF thinks that Modified Median is fairer whenever there are many participants. At Contre Gambit Philidor, Frederic Fournier analyzes my game as Black against Roshan Idnani. 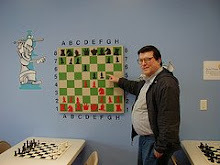 Spring Break Camp at "Chess Mates"
Above is the schedule for the spring break camp at Chess Mates. Please note that fun activities include swimming at the YMCA, which is one block away from the chess club. Last night, the Wednesday game/90 tournament started. 32.Nd4 Rc8 33.Ra8 Rxa8 34.Bxa8 Kf8 35.b4 Ke7 36.g5 Kd6 37.b5 Kc7 38.Bd5 Rd1 39.Kg2 Kb6 40.Bxf7 Ra1 41.Be8 Ra8 42.Bc6, Black resigns. 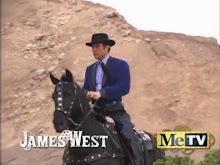 Norris - West @ "Contre Gambit Philidor"